Maximize output with minimum product loss. Offers speeds, of up to 40,000 capsules per hour for powder, pallets and tablets. Feasibility of Micro-dosing up to 15 mg with an accuracy of ± 2mg depending up on the formulation characteristics and flow properties. Each segment consists of 6 no. of holes. Turret assembly fully closed for safety. Capacity 80000 to 90000 capsules per hour. 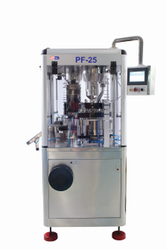 We are offering Automatic Capsule Filling Machine (PF-90) to our client. Compact, sturdy, covered with stainless steel panels, hood covered with acrylic guard. Fill weight adjustment within seconds. 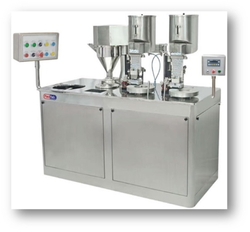 Tamping Mechanism’ for powder filling enables capsules to be filled with a weight variation with ±2%. Variable AC frequency drive for main motor ensures speed adjustment. Faulty capsule and filled capsule ejection stations with individual air controls. Special purpose gauges provided for quick and easy change over. 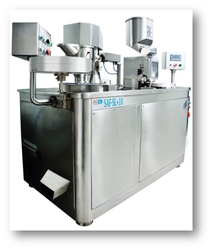 We are offering Automatic Capsule Filling Machine (PF-150) to our client. Each segment consists of 22 no. of holes. Automatic closing and ejection of filled capsules to ensure operator safety. Capacity 5000 - 6000 capsules per hour. 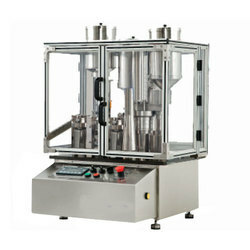 We are offering Pharma Capsule Filling Machine to our client. Easy install the machine on any work bench. Auto rejection of unopened capsule. Perfect for R D Lab, small size production for trial research or small productions. Fully automatic and controlled by programmable controller. 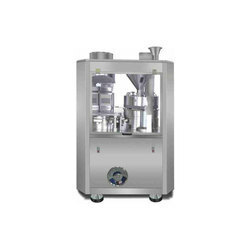 Machine for small or medium size batches. 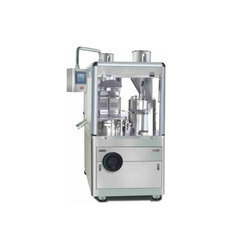 Offers speeds, of up to 25,000 capsules per hour for powder, pellets and tablets. Feasibility of Micro-dosing up to 15 mg with an accuracy of ± 2mg depending up on the formulation characteristics and flow properties. Each segment consists of 4 no. of holes. 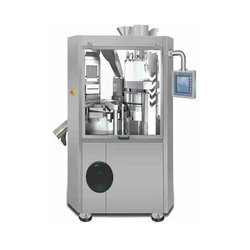 Looking for Capsule Filling Machine ?